Last September I posted an article on gas prices (to which someone had a very thoughtful Reddit response), why prices were falling, and how to account for price discrepancies within the United States. Since then, the international price of oil has kept falling and falling. 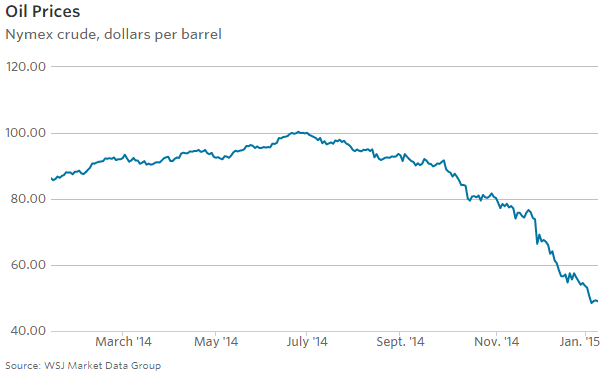 Earlier this week the price even punctured the $50 a barrel mark. This precipitous fall in the price of oil has caused conspiracy theorist to claim that the United States is secretly engineering markets to put pressure on our international enemies such as Venezuela, Russia, and Iran. Do I think that the United States is doing this? Yes, absolutely. But do I think this is a conspiracy? Hardly. Exhibit A is the recent appointment of Department of the Treasury Under Secretary for Terrorism and Financial Intelligence, David S. Cohen, to the Number Two spot at the CIA (Deputy Director). The White House is not hiding anything about this guy. They say he administered anti-terrorism funding programs, particularly against ISIS, as well as sanctions against Iran and now Russia. Economic espionage is official government policy, and it does not seem to me that they are trying to hide that at all from anyone. Oil producing countries, particularly the members of OPEC, have been using the price and quantity of oil as a foreign policy tool for decades. Exhibits B & C, the 1967 & 1973 Oil Embargoes, where Arab countries used their leverage in the energy market to place political pressure on the United States. The United States, too, has used oil as a political tool in the past. Many historians claim that Pearl Harbor was the result of Japan’s hand being forced by an Allied embargo on oil reaching Japan. To return to the economic, not political, side of things, the market for oil is an oligopoly. There are a few large suppliers, and there are significant barriers to entry (primarily being that certain countries simply do not have the natural resource underneath them in the ground). More specifically, the market for oil resembles a Dominant Firm Oligopoly, with Saudi Arabia being the dominant firm. As the world’s largest producer of oil (13% of world production), it commands a great deal of pricing power – power that smaller “firms,” such as Venezuela, Ecuador, Nigeria, Iraq, Iran, Libya, and Qatar cannot match. So theoretically, Saudi Arabia could sell its oil at a lower price, and the other countries would have to lower their posted price, or else their clients would turn to Saudi Arabia, which has plenty of oil to supply if it wants to. And that is exactly what Saudi Arabia is accused of doing, through an arrangement made with the United States (many people point to a meeting Secretary of State John Kerry had in Saudi Arabia back in September). The conspiracy theorists claim that Saudi Arabia is selling its oil at a lower-than-market rate by keeping productions levels too high relative to international demand in order to drive down the price of oil internationally, in an effort to put pressure on the governments of Iran, Syria, Russia, and Venezuela. These countries all conveniently happen to be enemies of the United States and Saudi Arabia, and they are all also conveniently highly-dependent on oil prices for government revenue and social pacification. Saudi Arabia, from a purely economic point of view, has an incentive to cut production, which would send prices higher. Higher prices mean higher profits, which is better for their economy. Other oil producing nations feel the same way. However, the stars may have aligned this time for the US and Saudi Arabia to strike a deal and keep prices down. The US gets the assist of pressure on its enemies; and not just Russian and Iran. At the meeting between Kerry and the Saudis in September, the Saudis agreed to join the US coalition against the Islamic State. Saudi Arabia, on the other hand, may have bought itself support in its fight against the Assad regime in Syria, and the low prices will put pressure on producers in the United States and Canada, where it costs a lot more money to get the stuff out of the ground than it does in Saudi Arabia. Everyone at the table (a table set for two) gives a little and takes a little. So do I think that the United States and Saudi Arabia are at least in part engineering the fall in oil prices for their own political motives? Yes, absolutely. But do I think that this is a conspiracy? Absolutely not. This is just business as usual for the United States, where an economist is going to be our Number Two Spy.